This is a review of Health Plus Super Colon Cleanse herbal supplement. The manufacturer of this product claims it helps alleviate constipation and symptoms associated with it. It acts by creating a gelatinous mass in the bowels which absorbs fluids and waste mater lodged in the folds of the colon. Besides waste removal, Colon Cleans soothes the intestines and forms a slippery coating over the lining of the bowel which prevents waste from accumulating again. The main ingredient in this herbal blend is psyllium husk, a form of fiber made from Plantago Ovata plant. It is a bulk-forming laxative, meaning it soaks up the water and increases bulk in your stool, making bowel movements much easier. It promotes regularity without promoting flatulence, making it an ideal ingredient for those suffering from constipation and gassiness. The capsule is bovine based, meaning it comes from calf, cows and cattle. Health Plus recommends taking four capsules, two times a day, in the morning and in the evening with a cup to cup and a half of water. They can be taking with or without a meal, but the company advises doing it at least one hour before or after a meal. Children between the age of 6 and 12 should take half the normal dose, or two capsules per day. For optimal results take this product once every two months, however, it must not be taken for longer than 10 days at a time. 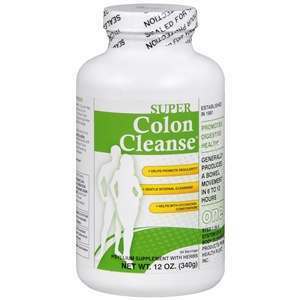 A bottle of Super Colon Cleanse containing 240 capsules comes at a price of $21.99. Price may seem a bit high, but 240 are equivalent to 60 servings, or a two month supply. I have used this product in the past and I am mostly satisfied with the results. I found out that for me, the recommended dose is a bit high, as I was forced to the toilet several times throughout the day. Two capsules twice a day was more than enough for a thorough cleanse. I also noticed taking capsules on an empty stomach can sometimes cause pain, so I advise you take them after meals, just in case. Customers who suffer from or develop abdominal pain, loose stools and diarrhea should stop using this product immediately, because Buckthorn and Senna are known to worsen these conditions. Manufacturer warns that this product contains chemicals known to the State of California to cause reproductive harm and birth defects. Customers dissatisfied with their purchase may return the product and get a full refund. Shipping costs are however not included. Customer reviews are present on the official website and are generally positive. Health Plus Super Colon Cleanse appears to be a popular product, judging by the number of mostly positive reviews. Although it does not seem like it, the price is actually really affordable. I find the high recommended dose and use of chemicals known to be toxic however, a major downside. Click here to learn about our Top Colon Cleansing Products. Elliot Spradlin	reviewed Health Plus Super Colon Cleanse	on November 14th	 and gave it a rating of 3.5.